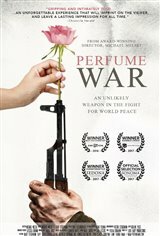 "Perfume War" held me in its grip from the first to the last scene. Love a good story of true friendship? Interested in strategies that have nothing to do with charity that can make a positive impact on people's lives in war torn countries? Curious about what it takes to turn a great idea into a successful business venture? Have you wondered how Trevor Greene is doing eleven years after being axed in the head by a young Taliban insurgent? Or, perhaps you've always wondered about the odds of making it to a Dragon's Den audition? There is all of that and much more in this compelling and inspiring story, supported by beautiful photography and perfect background music. I left the theatre with hope in my heart and even a little plan to check out the perfume department at The Bay. From someone who has refused to wear any scent since my teen years, that is a strong endorsement of "Perfume War" indeed.